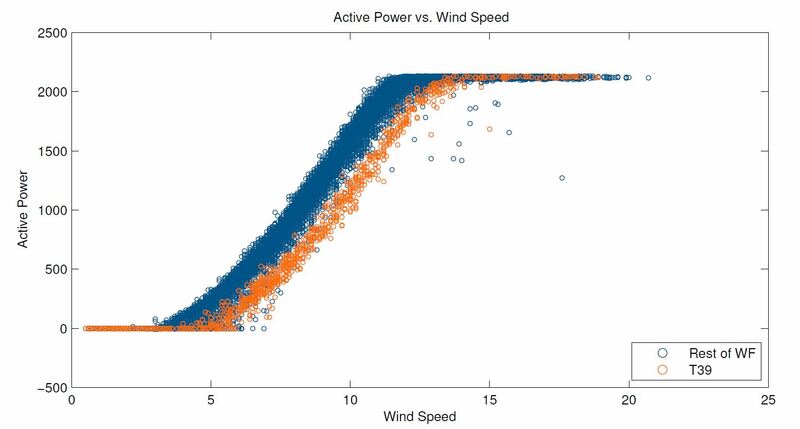 This wind turbine power curve report was generated when SCADA Miner detected underperformance. It can be hard to convince the OEM that their turbine has a power curve performance issue. They cite anemometer uncertainty (due to main blade wake) as a reason that nacelle anemometry power curve tests are inaccurate. In this particular case, the generation of two exception reports made a clear case for underperformance – the power curve test detected underperformance on T39 while a second test, looking at the agreement between the nacelle-mounted wind vanes, generated a report raising attention to misalignment of the two nacelle-mounted wind vanes. This same turbine also triggered exception reports on some additional tests. Due to the wind vane misalignment, this particular turbine was yawing much more than the rest of the wind farm. This was detected by analysing the count and duration of the digital outputs associated with yaw drive activation. These reports are displayed on the Turbine 47 list on our demo Trello board. These reports triggered due to the nacelle misalignment. This in turn, was stemming from wind vane misalignment. If the nacelle is not pointing directly into the wind, the asymmetrical force distributed across the rotor stresses drivetrain components. This triggered additional exception reports. Nacelle misalignment is a common cause of wind turbine underperformance. The alignment was easily resolved and the turbine power curve shifted back into the wind farm norm. This underperformance did not generate any alarms in the OEM’s SCADA system – the increase in production from this single turbine had a value which we estimate would have exceeded the SCADA Miner subscription fee for the whole wind farm.